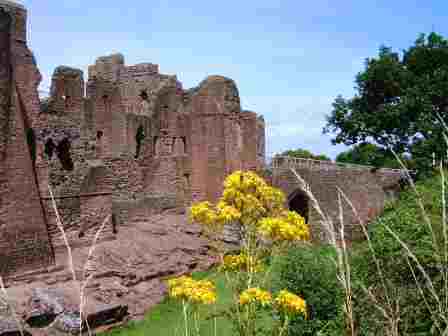 The massive ruins of the red sandstone Goodrich Castle, standing on a wooded, rocky spur and overlooking the tranquil waters of the River Wye, are pitted with numerous nooks, and crannies that exude an aura of tragic mystery. 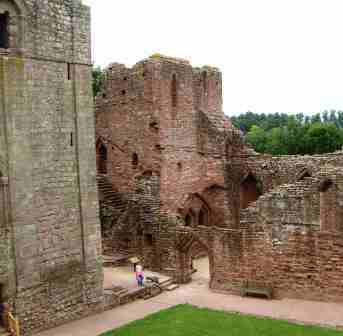 The mark of history most certainly casts a long shadow over the majestic, soaring walls of Goodrich Castle. As you explore its interior you really can sense the spirits of the numerous generations who have dwelt here as you pick your way around a castle that offers one of the most complete sets of medieval domestic buildings to have survived in any English castle. 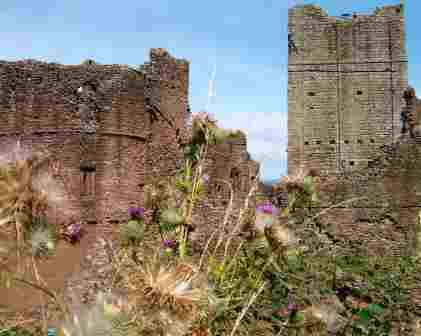 The oldest part of the fortress is the grey stone keep, built in the 12th century when Goodrich Castle was an important bastion on the border between England and Wales. Enlarged over succeeding centuries, Goodrich Castle last saw action during the Civil War, when it became a Royalist stronghold and found itself under relentless bombardment as Cromwell’s troops attempted to breach its mighty walls by firing 200 lb cannon balls at them from the aptly named mortar, “Roaring Meg”. During the siege Alice Birch, the niece of a Parliamentarian officer, took refuge in the Castle with her Royalist lover, Charles Clifford. We can only guess at the feelings of anxiety that the lovers must have felt as they awaited their fate. When it became apparent that the fortress would not be able to withstand the bombardment for much longer, Clifford and his young lover mounted his horse and, under cover of darkness, spurred the beast out of Goodrich Castle and managed to break through the Roundhead ranks. Unfortunately, when they arrived at the muddy banks of the River Wye, they didn’t realise that heavy rains had swollen its waters. As they attempted to cross its raging torrents, their horse lost its footing and they were swept away to their deaths. Such was the trauma of their desperate bid for freedom that their bedraggled earth-bound wraiths have been seen on stormy nights, urging a phantom horse into the wild waters of the Wye. On other occasions, passers-by late at night have seen their poignant spectres staring sadly from the ruined ramparts of Goodrich Castle. The text and images on this website are the copyright of Richard Jones. They may not be copied, stored or reproduced in any format without the express permission in writing of the copyright holder.